We are a beauty cosmetic studio in Berlin Mitte (near Gendarmenmarkt) and open up a completely new one to our customers Dimension of wellness and vitality. With us you will find a place of rest, relaxation and cordiality. Leave everyday life at home, as a highly motivated team of trained specialists in the cosmetics and beauty sector await you. Whether Facial Treatment or Body Treatments , Manicure, Pedicure or wedding arrangements: we guarantee you an individual treatment diversity full of luxury. 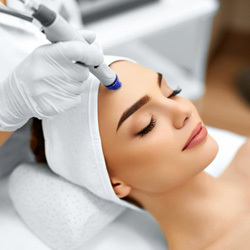 Our cosmetic studio impresses with over 25 years of experience in high-class beauty and attracts with its modern equipment and its steady expansion of the range. Whether Waxing , Manicure or Pedicure : Our concern is skin, body, health and relaxation. No wonder we are also among the top models and celebrities from film and television - Matt Damon, Claudia Schiffer, Pierce Brosnan, Scarlett Johansson and many others - as more or less insider tip under Berlins cosmetic salons . We advise you on the latest trends and developments in the beauty and cosmetics industry, which allow the stars from film and TV to be treated and pampered. 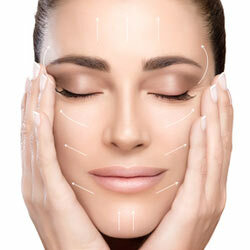 We offer a selection of treatments with different peels, which contain different ingredients. This exclusive treatment contains oxygen, plant stem cells, peptides (papaya and pineapple enzymes) in the skin. 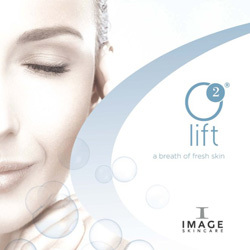 This revolutionary treatment gives the skin a radiant, refreshing and rejuvenated appearance. Enzyme facial, Oxigenating Facial Mask and Stem Cell Enhancers give a radiantly beautiful skin. Potent blend, from glycolic acid and retinol, reduces the signs of fine lines and wrinkles, leaving the skin taut and revitalized. A special therapy for poorly perfused, wrinkled, regenerative and impure skin, which is prone to inflammation. After an intensive depth cleaning the corresponding places are treated. Released ozone ensures optimal disinfection and regeneration of the skin. Alternating heat and cold treatment. The transitions occur directly, which strongly stimulates the metabolism of the skin. The result is a strengthening of the tissue and the muscles, the skin becomes firmer and takes up active substances better. Appearance, physical well-being and balance are an important factor in our modern service society. With our cosmetic institute, we are not only specialized in hand and foot styling for photo and film productions, but also bring you closer to many different aspects of beauty and wellness. Our comprehensive range of body and beauty care products are equally impressive for ladies and gentlemen. Whether massage, manicure, foot care, hair removal or problem skin treatment, we actively contribute to making you feel comfortable in your skin. Let us pamper you in our cosmetic studio, a unique place of wellbeing. We are waiting for you! Whether it is a radiant eye, well-groomed fingernails or pure and healthy skin: an attractive appearance opens numerous doors for us. Not only that, it also substantially supports our well-being and self-awareness. Health, radiance and well-being form the basis of the treatments in our cosmetic studio. Professionally trained staff and carefully selected quality products are a matter of course for us. We take time for individual needs in order to achieve the desired cosmetic result. The dermatologically tested cosmetic products we use will do your body well in case of allergies or diseases. The staff of our cosmetic studio will gladly advise you with regard to the selection and application of care and cosmetic products. Our wellness and relaxation offerings give body and soul well-being and balance. The perfect balance to the professional and leisure stress of everyday life! Of course, we are always at the disposal of our customers by telephone for questions and appointments. Our cosmetic studio is looking forward to your visit!